Meetings can easily become the #1 financial or productivity cost in any organization. Collaboration is an amazing tool for aligning people on a goal, refining ideas using feedback and discussion and sharing knowledge. However, as teams grow the amount of meetings easily proliferate, include an unmanageable number of people and become time sinks. For startups especially, time is probably the most valuable resource. Here I’ll provide eleven tips I’ve used across 50 to 100,000 person sized companies to make meetings shorter, more efficient, enjoyable, focused and actionable. At the last minute a colleague sends you a meeting invitation titled ‘Sync Meeting’ with ten people on the invitation list. Everyone assembles in the conference room, opens their computers and continues working. Typing away. Meanwhile, the organizer launches into a slide-deck after which two people engage in a discussion with the organizer, talking over each other, while most others silently sit working on their computers. A couple look up momentarily to offer their input. At the end, the meeting concludes after running over by twenty minutes. The organizer thanks everyone for joining, but did anything productive just happen? Unless you are taking notes or presenting, everyone’s laptop should be closed in a meeting. I’ve seen it hundreds of times. 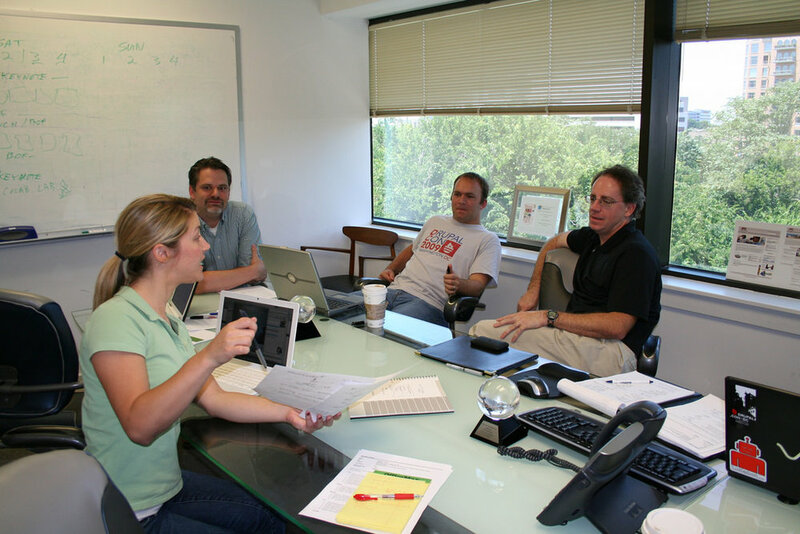 As soon as its clear one person is not paying attention, many other people take the cue to work in the meeting. It decreases participation and the value of the meeting itself. So does this mean you should attend meetings and stare into space? The answer: no. If you do not see value from a meeting, simply do not go. Attending any meeting means disrupting your flow and losing individual productivity. Attending and not paying attention decreases meeting value. But how do you know whether a meeting will provide value to you or the topic? Whenever I receive a descriptionless meeting invitation I will not accept until I get an agenda. It is the only way I can know whether this is a good use of my time or whether I should include someone else in my place more versed on the matter. Meetings have a high organizational cost so there should be some barrier on organizers to ensure they are used correctly. Note: Ideally, every item on the agenda should have an owner and estimated duration so one item does not take over the whole meeting. I believe in a highly transparent workplace, but that can mean inviting way too many people to meetings. So I include in my meeting description who I need to attend and mark everyone else as optional if they feel they have something to contribute. There is actually a rule of seven for maximum number of people in a meeting before you reach diminishing returns. I’m sure we’ve all felt bored in an All-Hands, organization-wide meeting or “cross functional brainstorm”. For large meetings it is better to assign representatives for certain functions than invite the whole team. A culture of trust in the decisions of others, paired with transparency (such as sharing meeting notes) reduces the amount of FOMO. Parkinson’s Law: If you have the time, you will fill it. Armed with an agenda and estimated item durations, you should have an idea how long this meeting should be. Most of the time, if you take your meeting duration and decrease by 25% you will be more focused and still reach your outcome. (Ex: 30m -> 20m, 60m -> 45m). All efficient meetings and discussions have a moderator to keep to the agenda, make sure everyone is heard / engaged and ensure the meeting’s goals are reached. This is probably the most important aspect of running a meeting since the moderator ensures tips 8, 9 and 10 are followed. Robert’s Rules of Order are a complex set of rules for managing efficient meetings in large groups. It is mostly overkill for the average meetings, but things like raising your hands to signal you would like to speak can take the stress out of people talking over each other to get their word in. Enforced by the moderator, this was a game changer when I joined Vida to change the discussion dynamic from talking at each other to listening to each other. It is easy to get into a topic that needs a lengthy discussion and hijacks the agenda. However, a meeting with seven people is not the time for 2-3 people to go into details on something not relevant for the rest. The moderator should use terms like “take it offline” to discuss in more detail outside the meeting or “parking lot it” to short-circuit topics that are valuable but not on the agenda. If there is time at the end, revisit the ‘parking lot’ topics and release the rest of the meeting attendees. If you don’t have action items with specific owners, then it is unlikely your meeting was useful. Near the end of an agenda item, the moderator should wrap up discussion and try to reach a conclusion and/or path forward. Always assign action items to people or they will not be accomplished. Record them in the meeting notes and have a follow up policy. If a recurring meeting, I like to address the status of the last meetings action items at the beginning to promote accountability. These are great tips, but what if people do not see meetings having a high cost? Use a meeting cost calculator or better yet, add an integration into your company’s google calendar. If your company isn’t running efficient all hands you could easily be losing wasting $30k in that meeting alone. I hope you can use these tools to modify your company culture and rescue your time. Best! Brice is an outdoor adventurer who has worked in Silicon Valley for eight years in side-projects, startups and large companies primarily perfecting mobile apps from design, engineering and product points of view.